← What do you expect from 2015? The next train will leave at 10 o’clock, the lady at the counter signals by raising both her hands and stretching out all of her ten fingers, as if a robbery was in progress. The ticket for one of the most beautiful train rides in Europe costs 3.20 Euros (less than 4 US dollars). 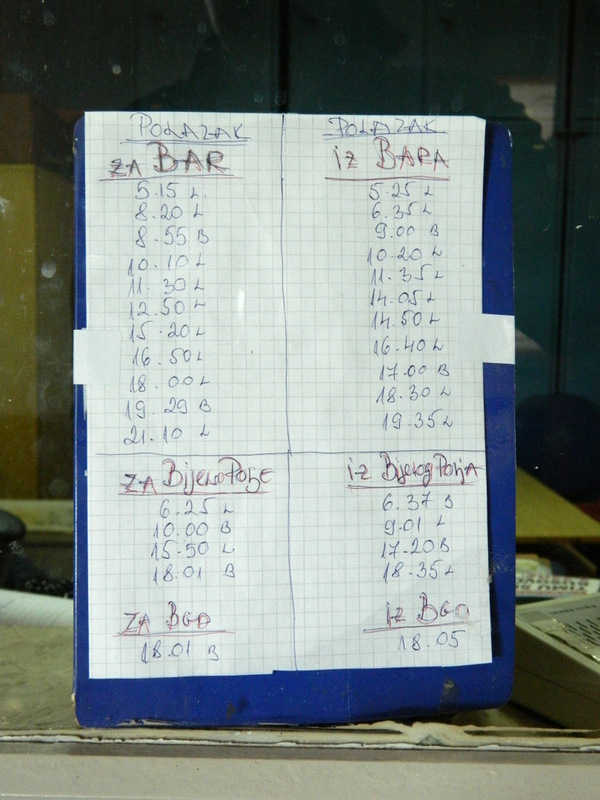 At another counter, I later discover a handwritten note with the departure times of the most important train connection in former Yugoslavia. I still have 20 minutes left. The little shop doesn’t have Coca Cola, but Cockta, a Slovenian Cola substitute which tastes more refreshing, but doesn’t inject any caffeine. And a chocolate bar for the train journey. On the platform for track 3, there is a man with a chainsaw. That one must be the right track for the train into the mountains. From Podgorica, the capital of Montenegro, I want to go to Kolašin, a small town in the mountains. Already before the first stop, still in the outskirts of the city, two police officers on the train are checking my passport as thoroughly as if I was about to leave the country. The route is indeed part of the train connection to Belgrade, but it’s still a few hours until we will approach the border. 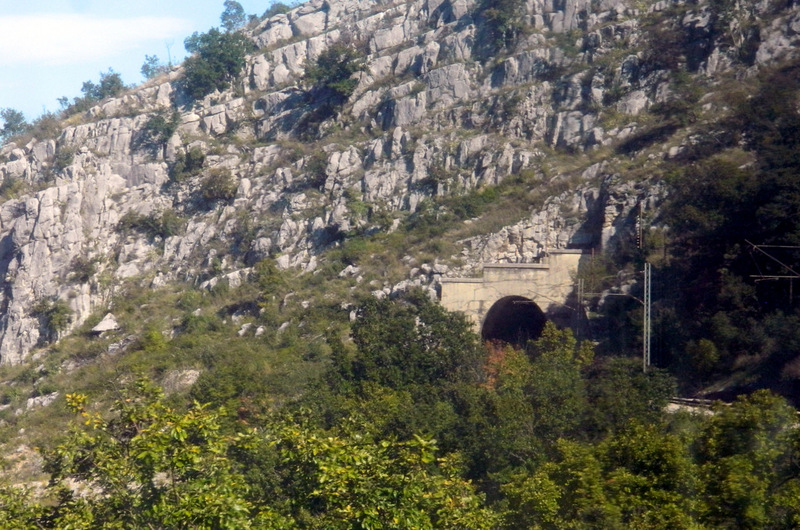 Back in 1855, planning began for a rail connection from Belgrade to the Montenegrin coast. Only in 1976, a full 121 years later, the whole 454 km (282 miles) were opened. 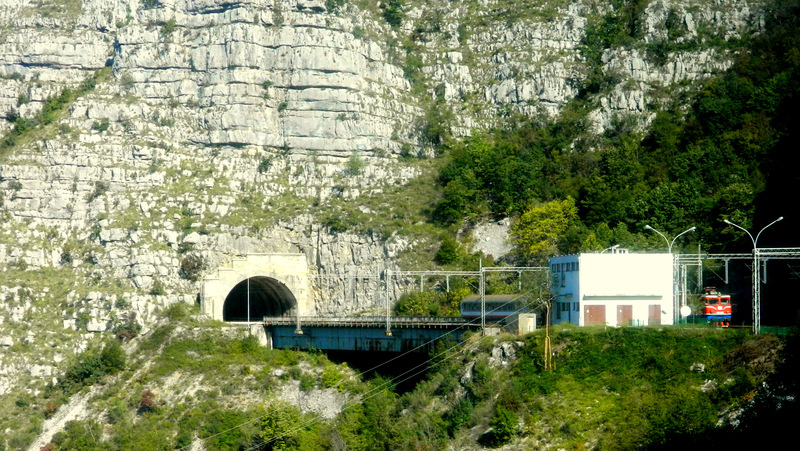 With 254 tunnels and 243 bridges, it was the most expensive infrastructure project in Yugoslavia. 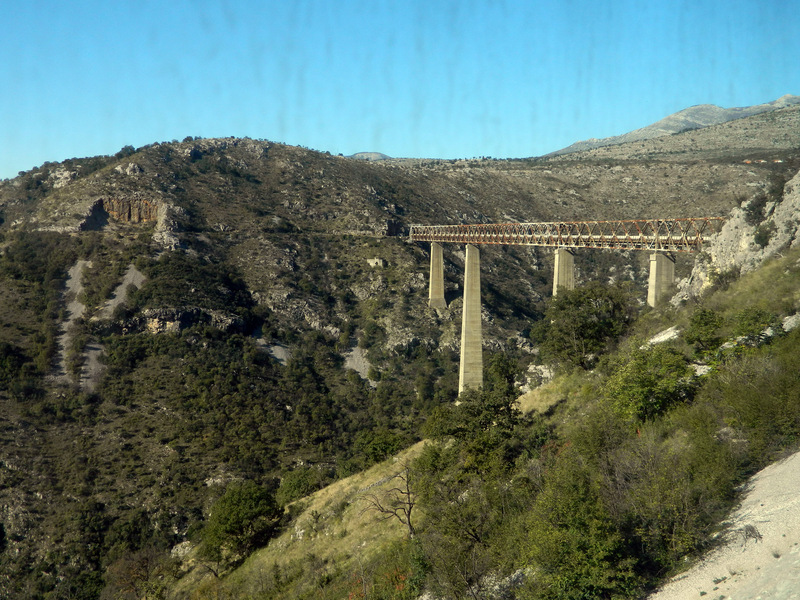 The railroad overcomes a difference in altitude of 1,000 meters (3,280 feet). 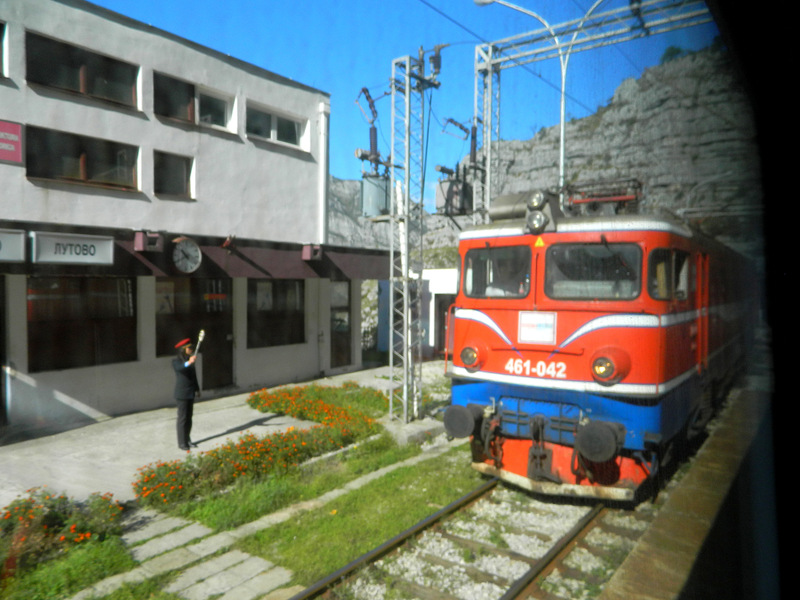 The train station of Kolašin, my destination today, is the highest station along the route at 1,024 meters (3,360 feet). Shortly after leaving the capital, the train begins to climb. A turquoise river meanders deep down in the canyon next to the rail track. 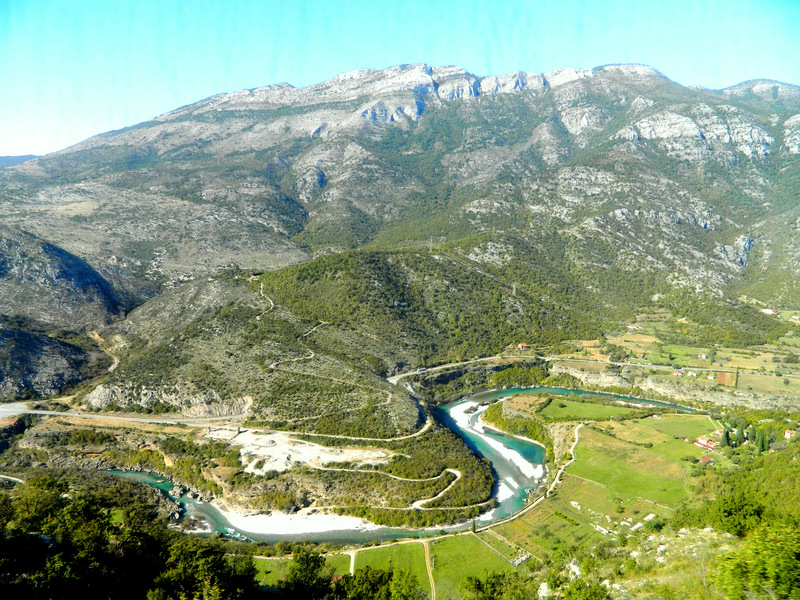 Rivers in Montenegro display colors which you otherwise see only on postcards from Sardinia and the Caribbean. My eyes quickly wander back and forth between canyons and mountains. A dramatic landscape with small mountain villages in between, in which the unplastered stone houses can only be told apart from the adjacent stables by the satellite dishes. And tunnels, tunnels, tunnels. A quarter of the whole distance runs through tunnels, the longest of which are piercing into the mountain for more than 6 km (3.8 miles). Sitting alone in the compartment, I am writing these notes and jump up again and again to rush to the window and take photos. On the right hand side the mountains rise as steeply as they fall down on the left. This train journey has to be made at least twice, because once is not enough to absorb everything. There are not many countries in which one can marvel at the most impressive natural beauty in such a simple, convenient and affordable way. 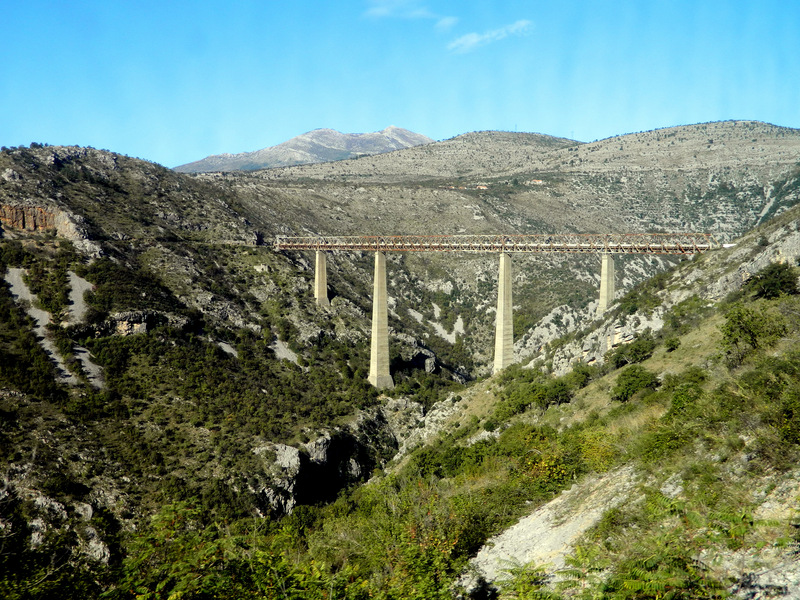 There it is, Mala Rijeka Viaduct. 500 meters (1,636 feet) long and 200 meters (660 feet) deep. The tallest railway bridge in Europe. I see it from afar, then another tunnel, and immediately as it leaves the tunnel, the train is on the bridge. Fantastic views are opening up. I can’t decide which side to look down first. The train winds its way across mountain passes, through canyons and across bridges. Building a straight line is impossible in this terrain. The engine takes the enormous ascent impressively easy. At stations like Bratonižići, where one railway employee stands in front of the lonely station building which is surrounded by dense forest, the train doesn’t even stop. It was not only geography which determined the route, but also politics. 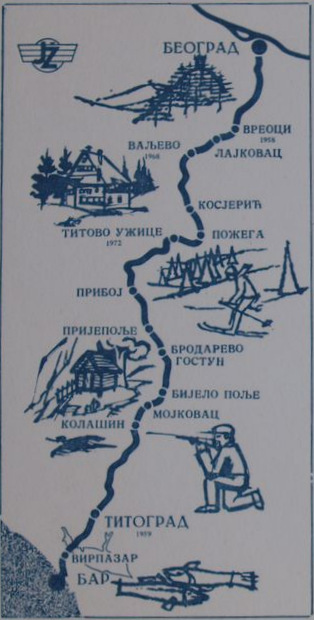 Before World War I, there was already an international conflict, mainly between Austria-Hungary and Serbia, about the routes of new long-distance railroads to be built. Serbia, which had no access to the sea, wanted to open up an Adriatic port with the rail connection. Austria-Hungary tried to counter with competing routes. It was this conflict over the Balkans, not the assassination in Sarajevo, which lead to World War I in 1914. But now everything is peaceful. The first snow-covered mountain peaks appear in the distance. Down in the valley, the road winds beside the river, while the train keeps ascending and towers above all other means of transport. As it should. At the stop at Lutovo, a train which came from the other direction is waiting. Nobody lives around here. Maybe the stop only serves the purpose of allowing the trains to pass because the line is mostly single-track. The railway staff working up here can only get to their place of work by train. That way, the company creates its own demand. The river has dwindled to a trickle. Caves have been blown into the rock, maybe by partisans during World War II or maybe there was some dynamite left from building the tunnels. Fall-colored foliage, steep granite walls like in Yosemite, a lonesome wooden hut in between. The fir trees on top of the Ostrovica tunnel are already wearing white. It is October. I would like to make this journey once more, but in wintertime. The journey to Kolašin took only 78 minutes, but it was 78 minutes of great natural cinema! Leaving the train, I see one of the police officers stretched out across three seats, sleeping, his shoes removed and his tie loosened. Despite the noon sun, this highest train station in the country receives me with an ice-cold wind. Except for the treetops’ sough, there is absolute silence. Only a few birds are chirping. Most of them have moved away for the winter, have frozen to death or have been eaten by wolves. In a basin, there is the town of Kolašin, still a considerable march from the station. 78 minutes on a train, and I feel far away from the lowlands and reminded of the opening chapter in The Magic Mountain. As I look back, the train has already left. 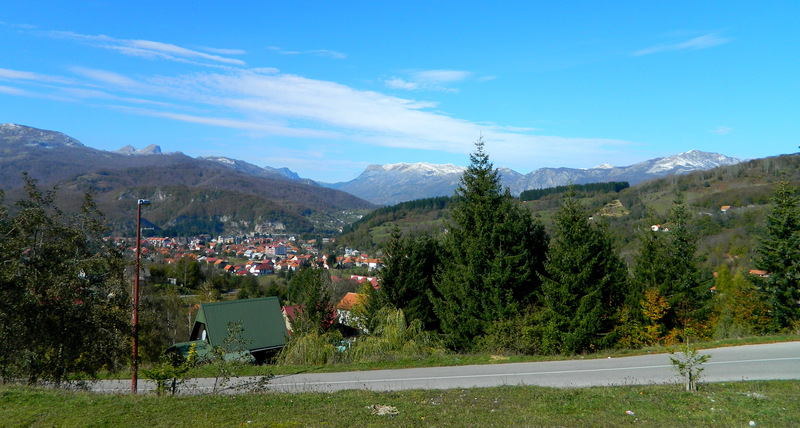 It will continue to Bijelo Polje, deeper into the mountains. Only one row of the chocolate bar is missing because I didn’t have time for it with all that marveling, photographing and writing. Usually, chocolate never survives that long in my company. The website of the Montenegrin railway company has an English version (click on the British flag). There, you will find timetables, prices and stops in between. The whole trip from Bar to Belgrade lasts 12 hours and costs 21 € in second class. There is one day and one night train every day. For the views, I recommend taking the day train. 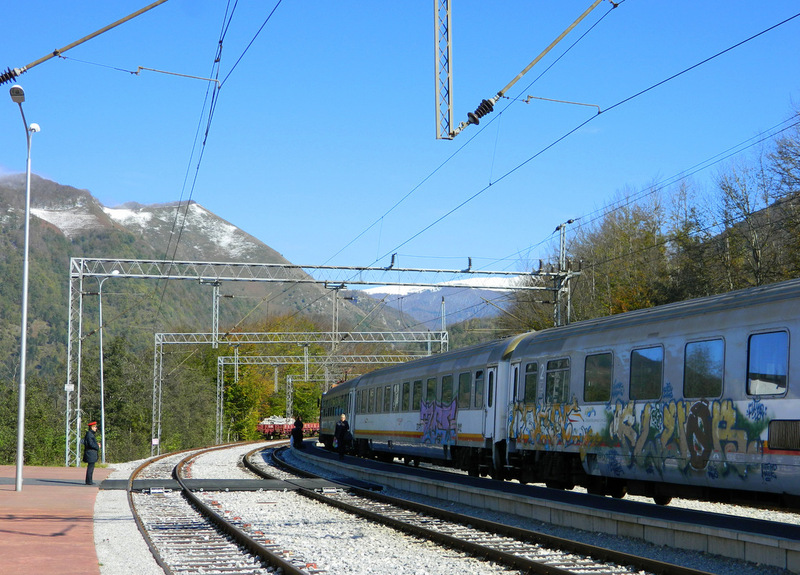 There is also a branch line going from Podgorica to Nikšić five times a day (2.80 €). 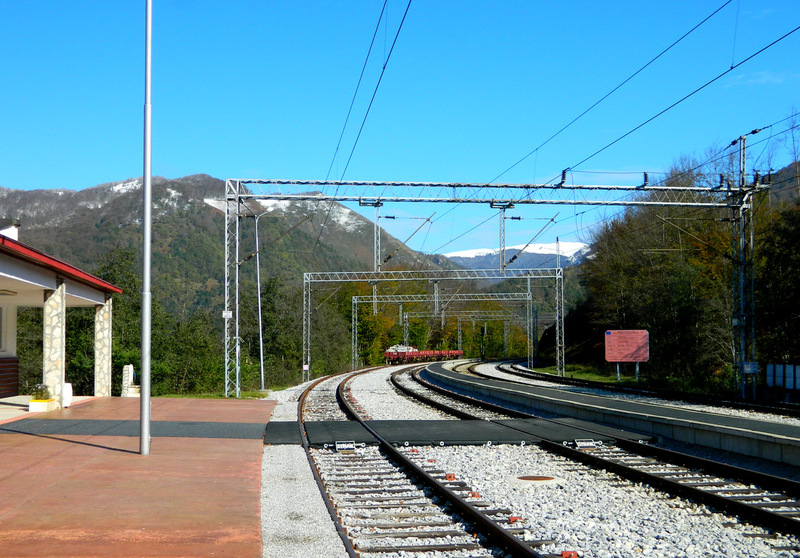 When you arrive at Podgorica airport, you can walk to the railway stop Aerodrom, about 1 km south of the airport and catch the train in either direction (Bar or Podgorica/mountains/Belgrade). Check the timetable before to see if it’s worth the wait. Economically, it’s definitely worth it because taxis from the airport to Podgorica cost 15 € (the train costs 1.20 € for the same distance). Nobody at the airport will tell you about the train, but it stops at the airport station 10 times per day (and another 10 times in the other direction). There are plenty of discounts for children, seniors (the train is free for anyone above age 75) and journalists. More on World War I. Some lessons from that particular Balkan trip. Zur deutschen Fassung dieses Berichts. This entry was posted in History, Montenegro, Photography, Serbia, Travel and tagged Bar, Belgrade, Kolasin, Podgorica, train, World War I. Bookmark the permalink. Beautiful! Like a fairy tale land. It is a very beautiful, interesting and friendly country all around. If someone could only pick one country in Europe, I might recommend Montenegro because it has it all. It is! 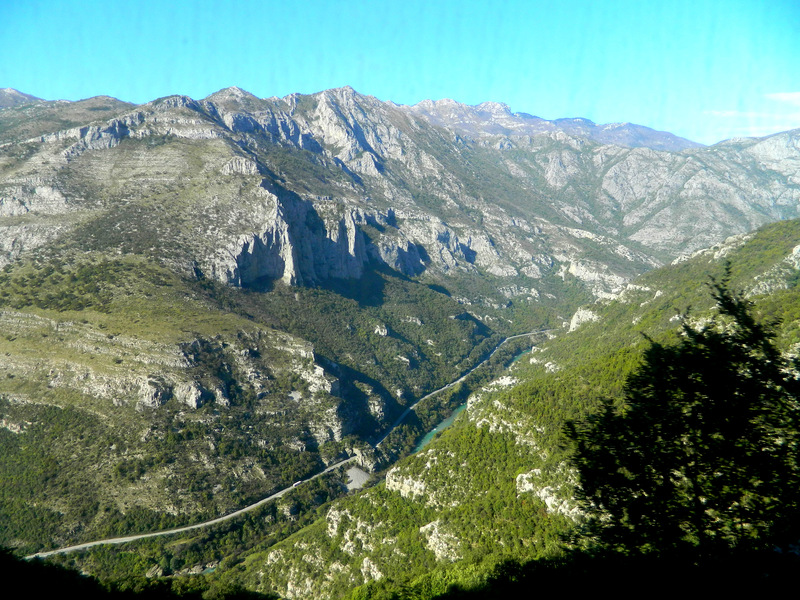 I’d love to return to Montenegro and just make this train journey every day. Thank you! I will post a video soon. You need to write a book on your travels and I need to buy it. You have such a wonderful way of describing these travels, interjecting them with snippets about policeman stretched out asleep. It adds such a wonderful tone. Though I will admit the historian in me saw “It was this conflict over the Balkans, not the assassination in Sarajevo, which lead to World War I in 1914.” and immediately wanted to know where you found this argument. I’ve never heard it before. I was hoping that a historian would stumble across that because I admit that my statement comes across as more apodictic than it should be. Of course World War I had many reasons and there is a reason why there is still more debate about the beginning of that war than about World War II. But I would argue that one of the reasons for Austria declaring war on Serbia was Austria’s intention to reign in Serbia’s desire to grow in territory and influence, e.g. by uniting with Montenegro or at least by building the train line that would give it access to the sea (Austria did have an Adriatic port in Trieste). I know that most people see the assassination of Archduke Ferdinand as the cause, but I don’t think it is. The declaration of war did not bring him back, nor was there even any official involvement of the Serbian state to be found. The assassination may have been one of the triggers, but it was not the underlying cause. The tension and the conflicts were there before. Since travelling more in the Balkans (specifically during my trip to Macedonia and Albania last year) and finding all the cemeteries from that era, I have begun to think that World War I actually started in 1912 with the Balkan Wars. As a source for this article, I mainly used the “history” section of the German Wikipedia entry on the Belgrade-Bar Railroad: http://de.wikipedia.org/wiki/Bahnstrecke_Belgrad%E2%80%93Bar#1850.E2.80.931914 The English version is much shorter, so it may make sense to translate the German one. Lastly, I apologize for taking up the time of a studied historian, because I am not. And I know how annoyed I would be as a lawyer if a layperson wrote blogs about legal issues. But I still do want to study history one day! I should point out that I’m calling myself a historian but I haven’t technically finished my degree yet, and modern history isn’t normally by choice of time period mostly because of the rigidity that it is taught with in schools. Your argument despite needing some fleshing out and source material other than wiki (should not be touched with a barge-poll) is intriguing. If you could find some primary source material that supported it you could stand it against any opposing points with confidence. As far as studying history goes, at University the course is focused on skills rather than the actual history itself. We’re basically taught how to pick apart documents and tear up the theories of others until they float down like ash on a breeze. If I wasn’t so determined to get my Masters after graduation and a phd after that, I’d probably be paying quite a lot of mind to doing some travelling myself. Well I’m edging towards medieval or early modern, but Europe will probably be the maximum for geographical scale. The Byzantine Empire is an interesting period, and I love my ancient history but I’d really like to study the principality states that ended up making Germany and their role in medieval Europe at some point. It would be wonderful to visit them or at least what they are now. I, on the other hand, know nothing much about anything before the 20th century. One thing which is sad about my vagabond lifestyle is that I can’t build up a library anymore. So I always leave many of them behind when I move. While I’m finishing up uni my parent’s house is the main storage for most of my books. The boyfriend has promised to build me unlimited shelving when we move in together though. I think leaving my books behind, especially some of the older more collectable ones, would be similar to chopping my arm off for me. At least in your case someone else will get to enjoy them when you’ve handed them over. In my case I just have friends turning up unannounced to switch books over. But realistically I should not kid myself either. It is unlikely that the next tenant in my flats in Lithuania or Italy or Romania will have the same interest in the same books as I have (and be able to read in English and German). Because of that, I sometimes take them to a library before I move. At least someone might get to enjoy them that way. A good book is worth its weight in gold. Great entry! I made that trip long ago and it’s stayed with me forever. I remember thinking the mountains looked very “Wild”. Oh yes! I would like to return to Montenegro once with more time and get off at some of these tiny stops in the mountains to enjoy the clear air, take a walk through the forest and just hop on the next train again. The handwritten timetable was really a wonderful sight. Keep in mind that this was not some tiny train station, but it was at the main train station of the capital city and these were the times for the main train through the country. Yes, that was an oversight by the filmmakers. The Pendolino train really goes between Nürnberg and Amberg in Germany and it thus accidentally revealed where James Bond lives. Or lived. That’s why he had to leave and is moving around the world now. It’s really beautiful, if you go from Bar to Belgrade, it needs ~12 hours but it worth! The train is going on the top of the mountains, while the road goes by the river between the mountains, this is also georgeous.